I opened my logbook and saw that for the last month(april2014) i have been not doing any HF or the usual SWL ! A month of absense.... People were claiming lots of contacts within a day.CW,DX etc etc band was very wide open, this happens very rare. But, in actuality we have very few hams and desnsity is really very low. So, what works in europe and amerika don't work in VU. we need more than 5 watt to communicate. 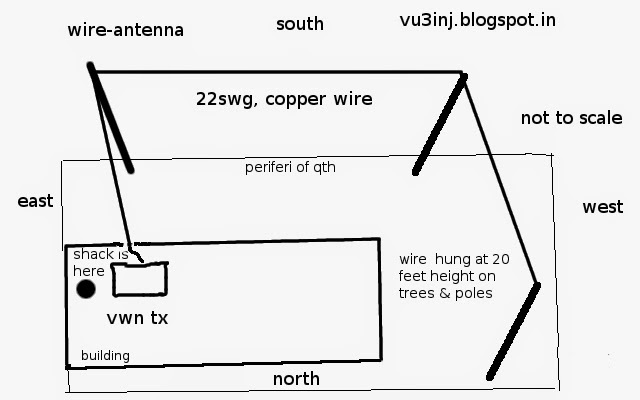 Please note that , Inverted-Vee, FULL DIPOLE dose not work as a first antenna. All the myth of loading the antenna was shattered. I dont have atu, gdo, antenna analizer etc. The more i read the success story, one thing stood out, that they used some sort of tuning, be it a simple lamp, variable capacitor or atu. In the past sought indian hams with vwn transmitters, used the dipoles strung between the coconut tree. I never herad inverted Vee or long wire. For the first antenna anyother antenna is not recomeneded , instead Just strung the wire.... and tune it with ATU, AMU ETC. Fact is, no body hinted this to me. Its not their faults. Most of the hams have commercial gears and producing 100 watt powers. So, basically there are very few hams who works QRP/p. Piece be on them. They dont have first-hand experience of real homebrew qrp and its challanges. My all systems are homebrew from the scratch. It does not have standard 50ohm input, output or anything standard at all. Standard comes from the quality of measuring instruments. which i lake (its a candid truth). That was the reason that i asked fellow hams, who have successfully brewed some transceiver to pass one of those working trx. Nobody understood it. Instead the formula of "teach a man how to fish instead of giving the fish was enacted". Well, what i can say on morale standards.... they are my friends and helped me without any gain. So, person has to make everything on his own and when he makes it , he is so much harassed that he don't pass on the informations to others and same cycle of frustrations goes on with another fellow........ one day he buys some second hand tx,rx and enjoy the bliss of commercial gears. Even in the second hand saling- there are few cheats who dump their non-working junked sets on others. Please don't get offended due to my candid words ! I brewed the tx in last year, 2013.... and it is still in the self idling..... group effort is needed to put a person on air. I know lots of friend called on me, we fixed sked and they tried hard to help me. My sincere thanks goes to them. That your effort, constant words of sympathy and comments is keeping me on. i compared the tx signal strength with inverted vee it did not go even 100meter. Then tried long wire fed at one end without any tuning. what a brave person i am to declare the results..... it radiates more than 100 meter with 599 report. i will test it for few km and then will make a tuner. 22swg, about 70 feet hung between two trees. As of 7 may 2014 made a test receiver using the ra3aae detector. I am operating the 9volt pp3 batery. will ride a bike and go to few km listening it. if it gives me 599 signal in the city area within 10km then will tell you friends. Well thats it folks. when wheel starts working you will know yourself by tuning on 7059kc , 30seconds on off pulses , 5watts, cw carrier. if you hear me please call me on my mobile number and we will have a sked.